It was nine years ago in August that we took our first road trip. With school about to start and some summer cash in our pocket, we set out to tackle the Lake Superior Circle Tour. We started the journey in Duluth, MN, heading north to Thunder Bay, Ontario. The entire trip would take us through Minnesota, Ontario, Michigan, and Wisconsin before completing the circuit back in Duluth. We didn’t realize it at the time, but we were laying down the foundation of a passion for travel that would spark the first Project Wildness road trip nine years later. Paying homage to our first ever road trip, we decided to do the Lake Superior Circle Tour again, but this time with a twist of Wildness. After a day of driving the Minnesota North Shore, we reached Thunder Bay, Ontario, ready to relax and enjoy the evening. Camping opportunities looked sparse so Nate started the search for an inexpensive motel. With few options in our price range, we quickly settled on the Munro Motel – a small “mom and pop” style joint nestled in a residential area far from the big chain hotels. As Marty took us to our room she continued the conversation by describing the different styles of management her and her husband have when it comes to the Munro Motel. “I get stuck working all alone here on a long weekend while he goes out and camps with his buddies.” Taking into consideration the incredible amount of work it requires to run a motel on your own, Nate asks, “How do you do it?” Without missing a step as she folded our fresh towels, Marty responded, “Coffee. I love coffee.” After folding the towels Marty wished us a pleasant night’s sleep as she walked back to the house. 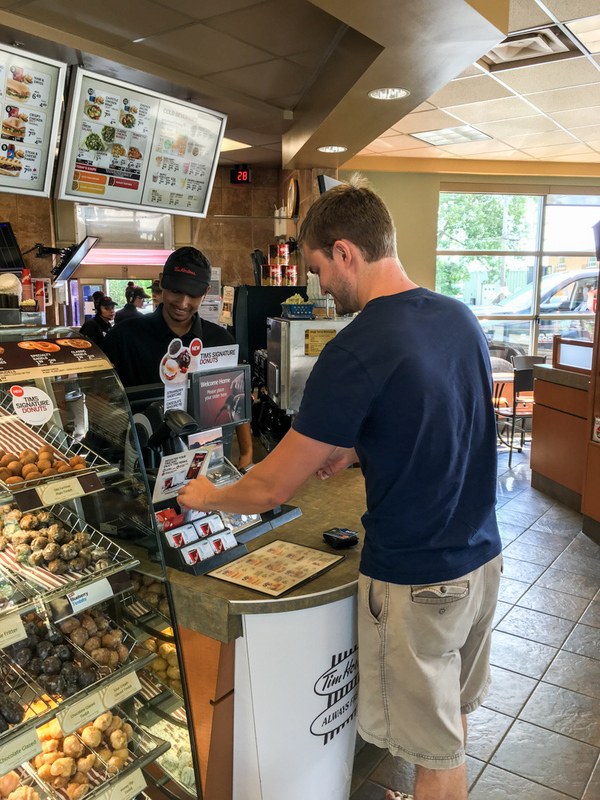 The next morning, we set out to show Marty a little appreciation by getting her some gift cards to McDonald’s and Tim Horton’s (her “favourite” two places to get coffee). When we returned to the motel, Marty had just come back from a local park. “I was helping the trees,” she said. A bit baffled, Nate asked, “How?” Once again, Marty educated us on the White Pine and how they can get open soars. Like a person, if that opening becomes infected the tree could die. “I go to a local park and put this stuff (a bottle of natural goop) on the open spots,” Marty explained. 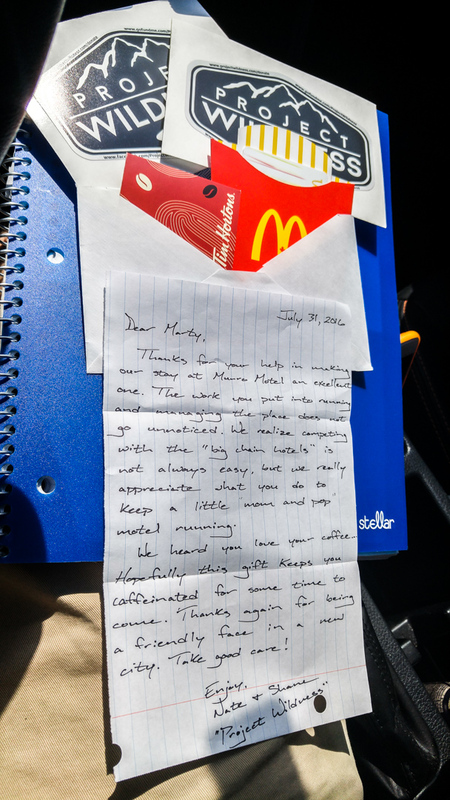 With our last Marty conversation coming to an end, Nate handed an envelope with the gift cards and a note to her and said, “Marty, it was an absolute pleasure meeting you and staying at your motel. I know you work really hard to keep this place running and we just want to let you know that it doesn’t go unnoticed and that you are appreciated.” A bit shocked, Marty thanked us for the gift and for being such great guests. To Kim S… Kim, I think it’s only fitting your donation go to someone else’s coffee fix. After all, you’ve drank plenty of it over the years! You’ve always been a proponent of keeping the small local shops in operation in an age that has seemed to forget them – something I really admire about you. The Munro Motel reminded me of the old days, an interest I think we share. Your donation helped a struggling business owner by giving her a good reason to keep a smile on her face. Thanks for supporting us! 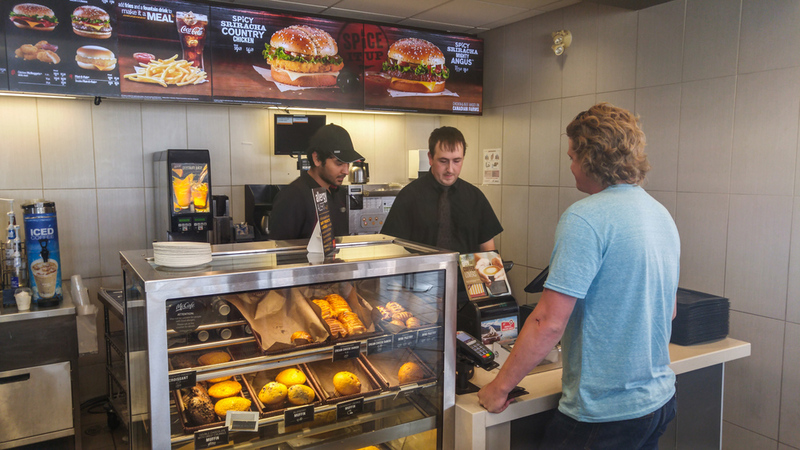 To Karen and David H… Today you helped a woman from Thunder Bay, Ontario, maintain a positive attitude in pushing forward in a difficult business. There’s no doubt it’s tough, but your donation helped us recognize Marty and her determination to keep her business afloat – not to mention her love for coffee! Thanks for lending your hand to us so we could lend our hands to her!